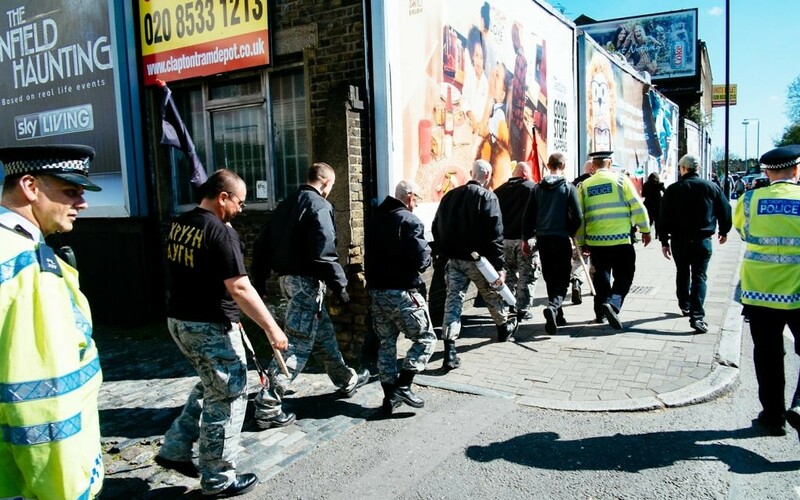 A neo-Nazi group being escorted by the police down the road in Clapton. Progressive Jews have criticised police action “facilitating” a neo-Nazi march in Hackney on Saturday. The far-right group were prevented from reaching their intended destination of Stamford Hill, as Hackney police sought to avoid clashes between anti-fascist and left-wing groups in Clapton, but officers still had to defend their actions. Jewish group Jewdas took part in the counter-demonstration, and members claimed that the far-right protesters carried banners reading “Rights for Whites” and promoting offensive rhetoric about “Jewish power”. Alongside other activists and local community members, Jewdas claim that they were kept in a police containment area whilst the group were escorted down towards a local mosque at Lea Bridge roundabout.